Saturday 19th May saw the UK OpenStreetMap community and Open Data Manchester join forces for an afternoon of exploring central Manchester. Several mappers from the Midlands made the trip and boy, did we have fun! Our hosts had prepared some great “Explorer Backpacks” and we soon broke off in to teams for our expeditions into the unknown. From the waterways to historic relics, the missions were wide ranging – we even had a Geiger counter on hand to find the spot with the highest background radiation! After soaking up the sun we headed back to Federation House to share our findings before heading for a well earned drink. 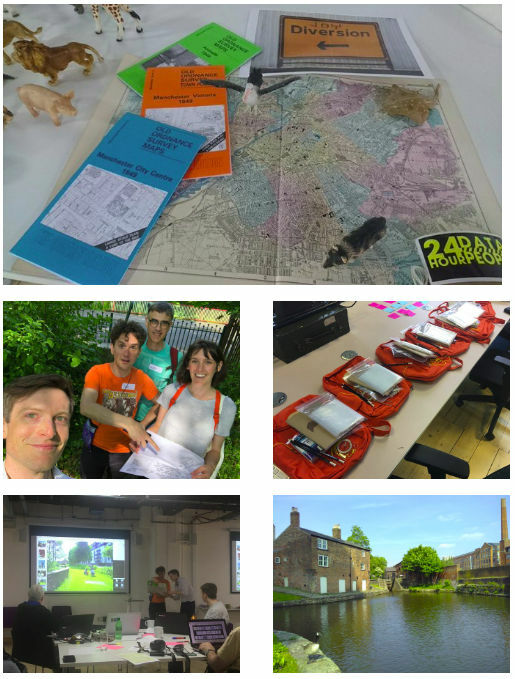 Dan S: It was ace, in particular the slightly whimsical mapping trip we did, following psychogeographic suggestions prepared by the Joy Diversion organisers. That was a good way to get new mappers and experienced mappers working together on an equal footing. Samantha: I really enjoyed the event on Saturday. I’d love to get out and about around Manchester and learn more about the city in general. If anyone else is local and wants to go exploring, to add to the map or otherwise please let me know. Tony Shield: Really enjoyed the ability to meet like minded people and get a deeper understanding of the OSM project. Going out and surveying then placing the information on the map was great. Seeing some of the uses the data could be used for was really interesting. Martyn: Joy Diversion was a great afternoon, I’ve just updated OSM with the Team Crocodile survey (cycle and car parking, playgrounds, water taxi, footpaths and more). Keep on improving the map. A big success then! Partnering with Open Data Manchester worked really well. Nice folk and a good opportunity to spread the word about OSM without having to arrange a venue and drum up attendees from scratch. Post content: OpenStreetMap United Kingdom CIC (with minor amends). Local mappers Brian and Rob are Directors of the community interest company, which focuses on supporting OSM in the UK.